9ct Gold Diamond And Amethyst Three Stone Ring. 9ct gold, three stone amethyst and diamond set dress ring. 9ct gold, diamond and amethyst three stone ring ring. Featuring three amethyst stones graduated in size with a diamond surround. The ring is Hallmarked for 9ct gold, assayed at Birmingham. The ring is a UK Size M, US size 6 1/4. Ring Size UK M, US 6 1/4. 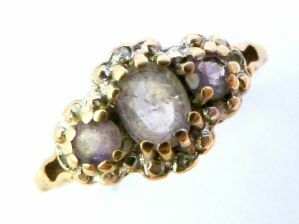 9ct gold, diamond and three stone amethyst ring. Hallmarked for Birmingham 9ct gold to the inner band of the ring. A lovely, modern 9ct gold, diamond and amethyst three stone ring.